S Africa to introduce Marine Sciences at schools - SABC News - Breaking news, special reports, world, business, sport coverage of all South African current events. Africa's news leader. Three Western Cape schools are piloting the course. Within the next few years South Africa will be the first country on the continent to offer Marine Sciences as a high school subject. 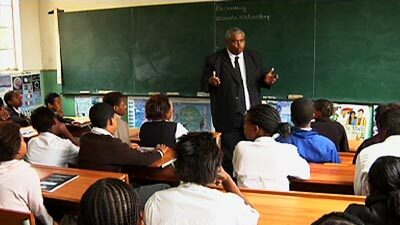 Three Western Cape schools are piloting the course. It is currently offered as an extra curricular subject. Developed by the Two Oceans Aquarium in partnership with education experts, universities and the national department of education. Without the ocean there would be no life on earth, it is one of the main sources of oxygen and food on the planet and yet we know less about what is right on our doorstep than what we do about the solar system. Now, the oceans are being brought into our classrooms. Four main areas will be covered; Marine Biology, Oceanography, Humans and the Oceans and Ocean Eco Systems. “This has more of a spin around the careers you can take for Oceanography, Marine Biology or even Maritime Law -all of those relate to this subject that we are offering and it’s specifically a stepping stone for students to be able to get into university and function more efficiently at university and that there’s a lower failure rate at first year level,” says Russell Stevens of Two Oceans Aquarium Education Centre. Teaching started at one of the three nodal schools, South Peninsula High, last week. Children from neighbouring schools are also welcome to join. “I have a deep passion for marine life and wild life in general and I enjoy the oceans and stuff like that, “says a Grade 10 Learner, Daiyaan Joseph. “I would like to learn about marine life and all the different creatures and everything to do with the ocean ’cause I love the ocean, mainly ’cause I love fishing and a lot of recreational activities that involve the ocean, ” added another Grade 10 Learner, Jade Jeftha. Introduced to Grade tens, they will have a Two Oceans Aquarium Marine Sciences Certificate in hand in their matric year. The curriculum has the seal of approval on an international level. “Even if they don’t want to go into the Marine field they would have knowledge of what’s going on around us. Southern Africa is surrounded by the ocean so they would be able to converse about what’s happening out there, they’d be able to support certain causes because they have an understanding, they’d be able to contribute to conservation and sustainability of marine life so it’s extremely important,” says South Peninsula High School Teacher, Andrea Padua. The interactive subject will include practical teaching in and around the aquarium and the ocean. It’s set to become a fully fledged national school curriculum subject within the next few years. This entry was posted on 22 Jan 2019,09:12PM at 9:12 PM and is filed under Sci-tech, News, Homepage Latest Stories Slider. You can follow any responses to this entry through the RSS 2.0 feed. Both comments and pings are currently closed.